Ubuntu 16.04 LTS (clean install). 64-bit. Final release. I intended to install MEGA Sync Client, Google Chrome and Dropbox by downloading the needed packages from their websites (respectively https://mega.nz/#sync and https://www.google.com/chrome/ and https://www.dropbox.com/install?os=lnx ). I opened the packages one by one with gnome-software and pressed Install - nothing, except for a super-quick progress bar animation, happened. No matter how many times I tried, same result. Also, an icon pops up on the panel saying "Waiting to install", but nothing seems to happen. This only seems to happen with third-party packages; installing a random deb from packages.ubuntu.com/xenial worked. I even tried to reinstall the system to make this work, but same problem. Gdebi, however, installs the packages as expected. Please fix this, it's a no go for an LTS release! Same issue here. Can't install any deb package in software centre. This is happening to me to. I cant seem to get either of the workarounds to work. When i try to install the gdebi package installer in the software center it does the same thing as when I try to install .deb files. I had previously installed things via the software center but now nothing is installing. I can't really do anything on my computer without any software. Please Fix! Same problem for me. I try to install Chrome. it just keep me waiting. and didn't give any result. Please try to fix it quickly. I thought I was the only one facing this issue, but it seems that it's a common issue. Hope it gets resolved soon. As Stanislav mentioned, in post #6, there are other ways you can installed these deb packages. However, even after you get the deb package installed, it breaks your ability to sudo apt-get update. There is also another bug report addressing that issue. Same thing happen to me. Please, fix it to continue enjoying Ubuntu 16! I have a similar problem, was disappointed to watch the software center not able me to install third party .deb programs. I believe it's a step back and a bad promotion for ubuntu. Also Gdebi doesn't solve the problem, returned me dependencies problem and wasn't able itself to solve. I couldn't find a report filed on this issue upstream already so I have done so and added a bug watch to monitor that here. Same here, trying to install Chrome or Skype. To anyone that has not noticed yet. Even the packages that ARE getting installed via this "Ubuntu Software" program, appear as NOT installed when one checks again. I tried with Audacity and Darktable. Both are properly installed.. both appear as if they are not. @PanosKatertziadis, Please report that as a separate issue. Though I believe I have already seen a similar report upstream, though I could be mistaken. This affects me as well. and check again. If it isn't working, please restart. Finally, if you're fully up to date (check again after the restart) please post back here, and we will look into it. Your Ubuntu distro would be helpful info too. There're no official updates for this software. The fix hasn't been released. There is no fix in Ubuntu 16.04? I'm with Ubuntu 16.04, still not working. I've updated my system a few minutes ago, only an update for Numix theme and G'Mic for Gimp. Maybe the fix is not available? I know there are workarounds to install deb packages but I am totally disappointed with the new package installer. Shouldn't this be properly tested before release? especially, before pushing a LTS release? All affected, apologies for the confusion but a fixed has landed upstream and has not yet landed yet in Ubuntu. The new upstream version will need to be packaged first before distributed to the main release pocket. If you need to install a package, please refer to comment #6 for the mean time. Thanks for fixing the bug, finally could install the vivaldi-third-party-deb from nautilus. It's not fixed as of 2016-05-24 08:50 edt. Installs sometimes happen but no indicator that the package is installed, just the same "Install" button shows. Further, "Important OS updates" does nothing for hours. I wind up using Synaptic to mark and upgrade the system. Synaptic is installed as Software doesn't display all available packages. I appreciate the efforts for all involved in the Ubuntu project. This effecting me to from adding programs from the Ubuntu software. Firewall says it's installed but when I try to configure it, it will not open up.I have uninstalled and reinstalled it and still nothing. Also when I try to install Ubuntu Tweak the same thing happens. I am new to ubuntu and facing this kind of error in the beginning isn't welcoming.. Being new to Ubuntu and already facing things like wont be able to install such things as Google Chrome and other 3rd party soft, and can't manage why is difficult. Hope this changes. Also affects me -- this is particular troublesome bug for new people (ubuntus target demographic) since Chrome, a popular browser with syncing abilities, can only be installed via a work around. Please fix this bug!!! This has not been fixed despite what has been claimed. I have done a clean install of both 16.04 and 16.04.1 and the bug persists. Come on guys, this is a LTS release, and this should be addressed. Work-arounds is not a solution for faulty software. It looks to me that when you try to install some package from the Software Centre, it starts the install then hangs. I believe this is because a dialog box should appear asking for admin credentials to install the software, but since that dialog box does not appear it just sits there waiting. My set up is a Dell Precision M4500 (but this isn't a hardware issue - it is most definitely a software problem). My installation is a fully encrypted hard drive with encrypted home directory if that makes a difference. Please mark this bug as not fixed. man, what a shame! A nice feature for the user broken soo long! Elevate the IMPORTANCE! @Peter please file a new bug about your issue since this particular bug is fixed, especially with a fresh install of Ubuntu 16.04. Please include specifics since there isn't enough information in your comment here for developers to know what exactly isn't working. You may find it helpful to read "How to report bugs effectively" http://www.chiark.greenend.org.uk/~sgtatham/bugs.html. We'd be grateful if you would then provide a more complete description of the problem. This bug affects me too. I know that apparently it's fixed on the "Proposed" repos, but I don't want to enable it because I don't want to became a beta-tester with my System. When be this fix available as normal update? Fernando, it is a normal update now. It was only a proposed update for a few days so it could be tested first to make sure it fixed bugs and didn't make things worse. The fix is also included in Ubuntu 16.04.1. If it's still not working, please run ubuntu-bug gnome-software to report a new bug. You may find it helpful to read "How to report bugs effectively" http://www.chiark.greenend.org.uk/~sgtatham/bugs.html. We'd be grateful if you could provide a complete description of the problem. In the meanwhile I've installed the previous Ubuntu Software Center that works ok and have a more clear design. Very thanks for answering! If I use this Software Center again, I'll report any problem following the steps you described. Is there any updates on a fix as over 4 months have passed and this problem still exists? When are they going to fix this bug? I found that SOME repositories don't have the package files for Gnome updates, but some others do. So for me the same symptoms occurred with Gnome updates. Changing my local repository to another one fixed the problem for me. In my case adding deb http://fr.archive.ubuntu.com/ubuntu xenial-updates main solved the problem. I downloaded the ubuntu-16.04.2-desktop-amd64.iso from Ubuntu's main website around a month ago and it has this bug. 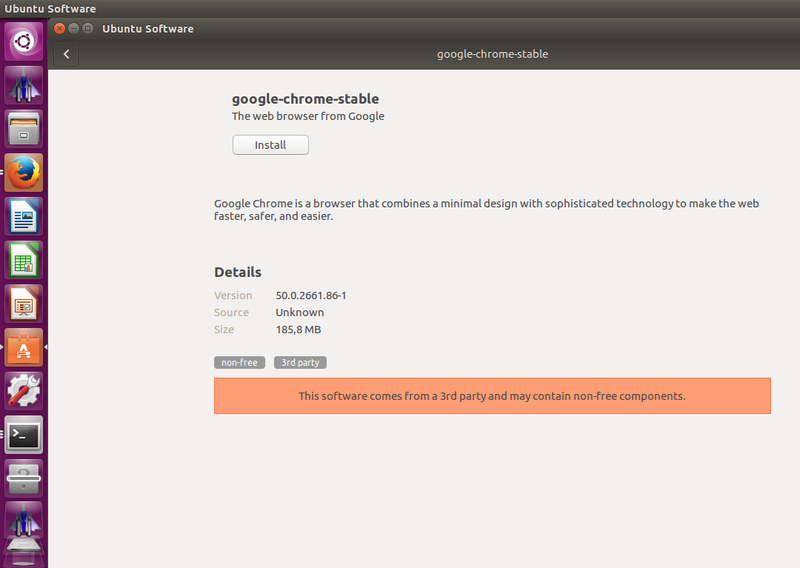 I tried to install Chrome using the GUI and it failed, but using dpkg was fine. Please open a new bug for that issue. Yes, I have just installed a clean 16.04 downloaded from the Ubuntu site last night and it has the same issue. Just installed Ubuntu Studio 16.04.3, also affects me. The issue still exists in Ubuntu 17.10, I can't install MySQL workbench or other software, I click install then I provide my password nothing is begin installed!. Not sure if its the same, I am trying to install megasync dpkg -i megasync.deb, after install there is a icon but it just doesn't start, syslog shows nothing for it, it seems that its not installed, is it the same bug? I have made an Update (sudo apt-get install update) and than I´ve made (sudo apt-get install gdebi). Now I can run the Software Center on Debian as a virtual Machine. Displaying first 40 and last 40 comments. View all 108 comments or add a comment.